Everyone that has ever tried or know something about Indian food knows naan. It’s one of those quintessential item found on almost any Indian restaurant menu. Typically, naans are cooked in extremely high heat clay pot “ovens” giving them the characteristic texture and flavor. Having said that, can a version of the flatbread be made in a home kitchen for those of us that don’t have access to a tandoor oven? Of course, and I am going to share an easy recipe here. You will find many naan recipes online – using different flours, with or without egg, with or without yogurt, ghee (clarified butter) etc. I have had my own versions – with/without egg, using all-purpose flour, combination of all-purpose and whole wheat, bread flour etc. I made this recipe for few guests who prefer the taste of all-purpose flour. Feel free to replace half the flour with whole wheat without sacrificing the texture or taste. Also, since this recipe does not use any eggs, it is good for people who don’t/can’t eat eggs. A whole cup of yogurt used in this recipe gives the naans a slight tang without being overpowering. Lastly, you can mix in 1 – 2 tablespoons of dried herbs (or about 1/4 cup of chopped fresh herbs) such as mint, cilantro or even green onions or finely minced garlic or curry powder to the dry mix before adding the liquids. I used a mix of dried herbs in mine and have prepared past batches with garlic (yum!). These naans can be prepared ahead of time, cooked and frozen. Just dab with a pat of butter and reheat just before serving. 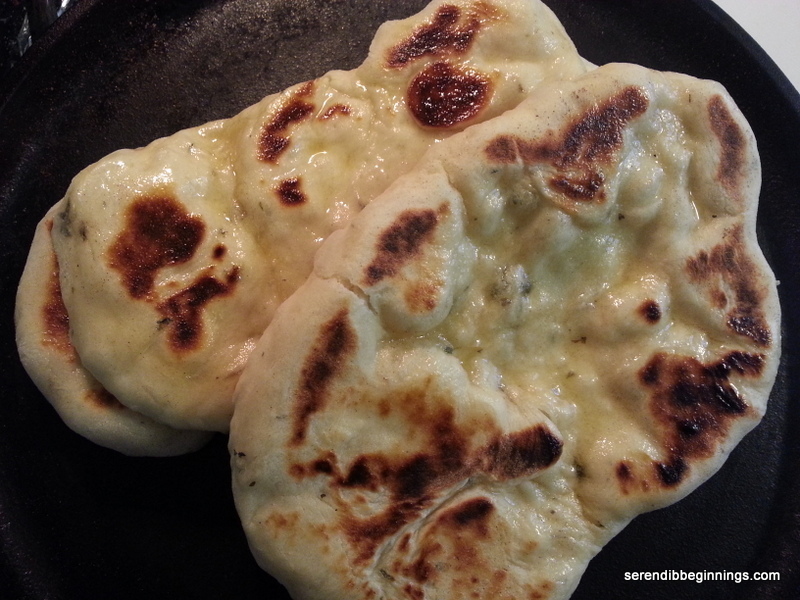 Enjoy warm naans with curries, or as a pizza crust, pita etc. 1. 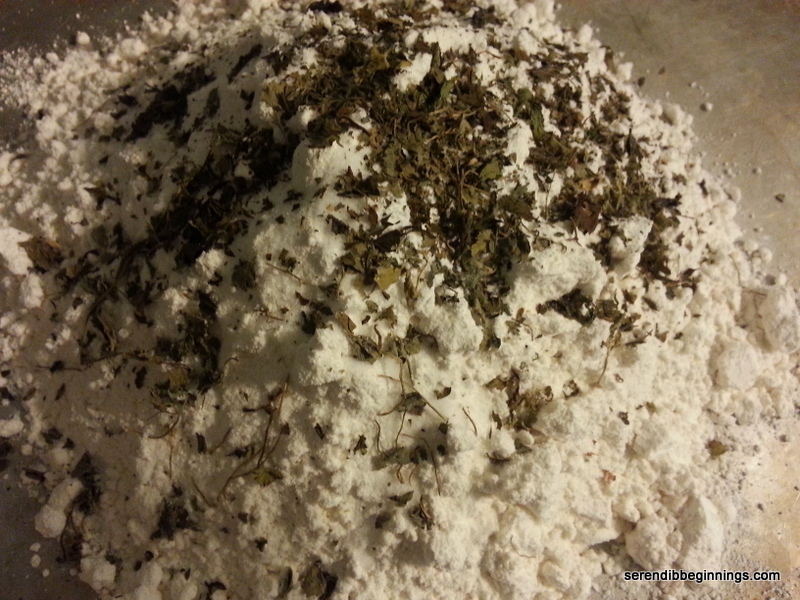 Mix all dry ingredients (flour through salt) in a large bowl or large, flat container. 2. Stir together warm water, milk, melted butter/ghee, yeast and honey. 3. Add yogurt to the dry ingredients and stir to combine. 4. 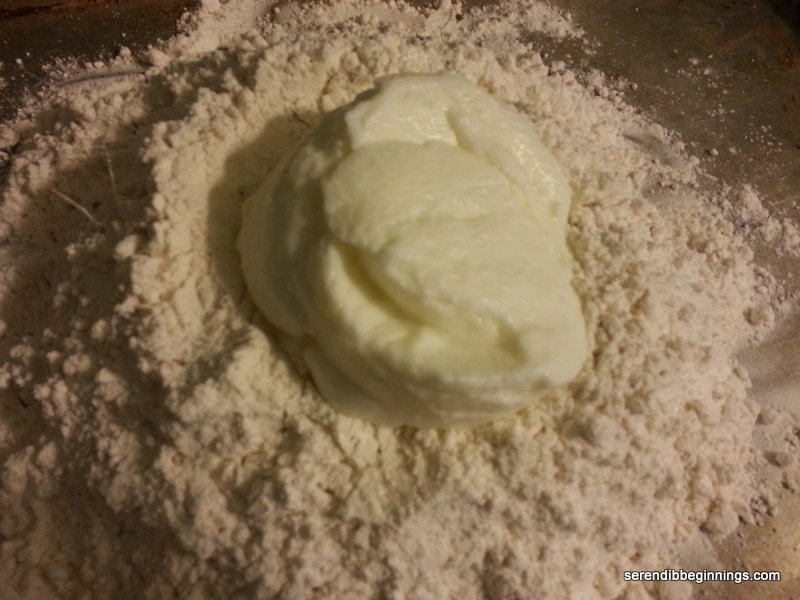 Add liquid mixture and form into a dough. 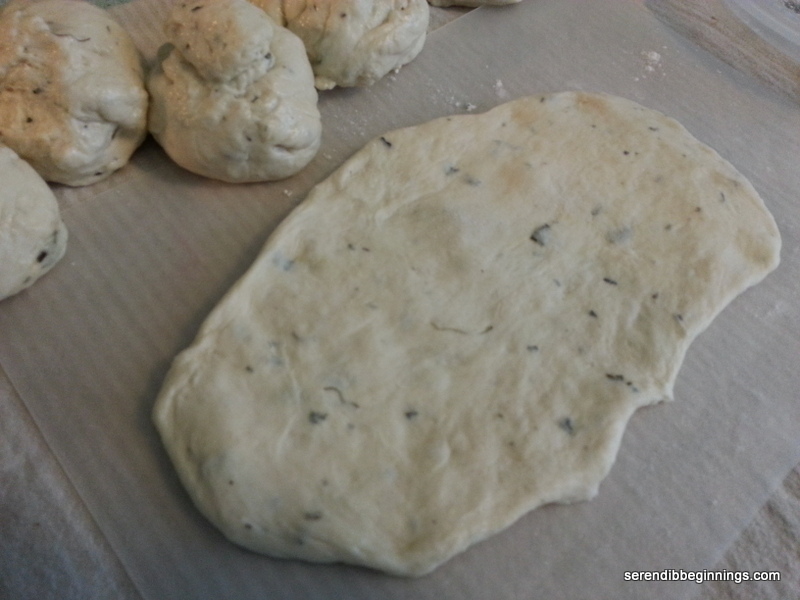 Turn onto a floured surface and knead for 5-10 minutes till an elastic dough forms. If the dough is too sticky, add a tablespoon or so of flour, but no more. 5. Coat a large bowl with oil and place dough in it. 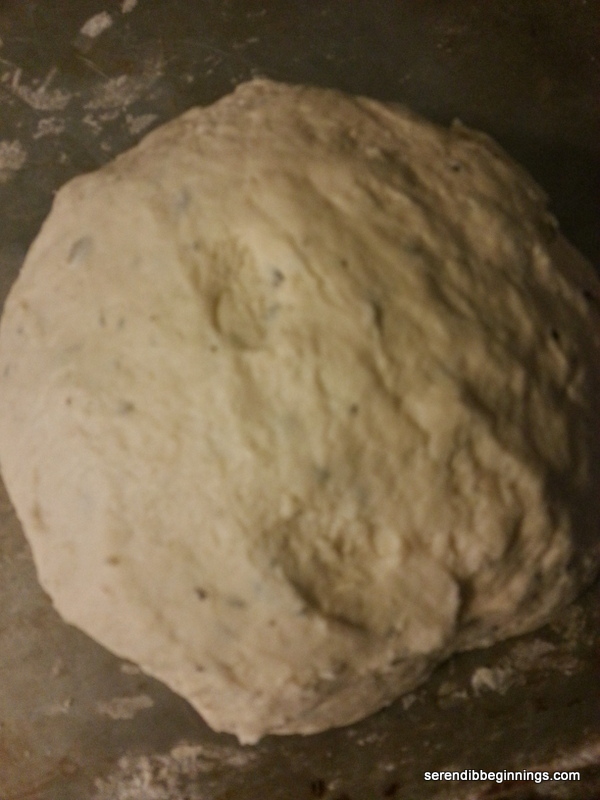 Let proof in a warm place (or in a turned off oven) for 1-2 hours till the dough doubles in size. 6. Break dough into 12 equal size portions and flatten each on a floured surface into an oblong shape (or a circle if you prefer) about 1/4 inch thick. 7. Heat a cast iron pan or a non-stick pan over medium high heat. 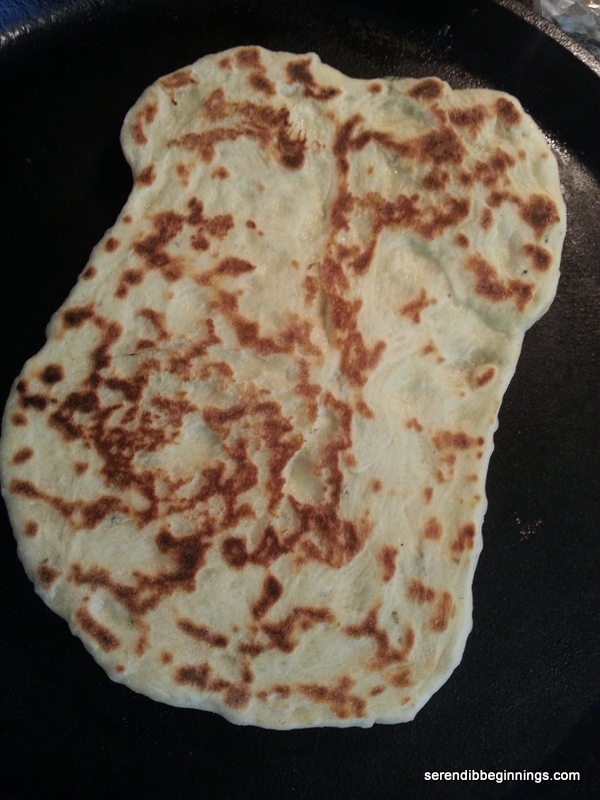 Cook naans one at a time for 2-3 minutes on each side. Brush with melted butter or ghee and store covered in a kitchen towel. 8. Serve the naans with your favorite curry or make as a pizza or a pita wrap. Enjoy!